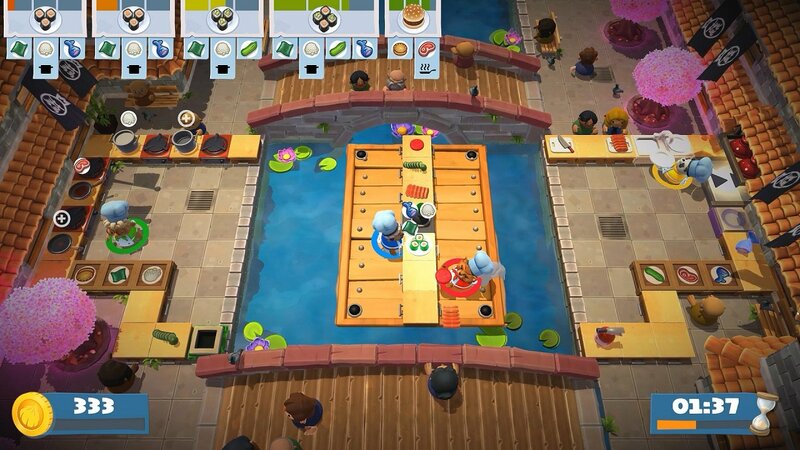 One of the first titles to truly show off the co-op power of the Switch was 2017's Overcooked, a fun arcade action game about chefs scrambling to get food orders out the door. Overcooked was a goofy, chaotic, and refreshingly original title that was a wonderful addition to the Switch eShop, so it was unsurprising that the sequel, Overcooked 2, was met with considerable fanfare when it was announced at E3 this year. With Overcooked 2, Ghost Town Games has managed to recapture the magic that made the first game special, while polishing it up with nips and tucks here and there to make for an overall tighter experience, if one a bit thin on new ideas. The story of Overcooked 2 is just as delightfully silly as the in its predecessor, keeping to the overall humorous and lighthearted tone that one would expect. After successfully averting the cataclysm of the Great Spaghetti Monster form the first game, the Onion King and his loyal chefs must now battle a new threat in the terrifyingly carb-inducing Unbread Horde. Unsurprisingly, this isn’t the sort of game that plops the plot front and center; it’s mostly put on the backburner after the opening cutscene sets the stage, but the story still does a good job of keeping things cute and funny. The many brief interactions with the Onion King and his dog, Kevin, seldom fail to tease a smile. Gameplay is almost exactly the same as that of its predecessor, but if it ain’t broke, don’t fix it. You play as cooks in a kitchen, tasked with getting as many orders out the window as possible before the timer runs out. Orders continuously pop up in the top left corner and the dishes that you serve change by the level; one stage may have you cooking burgers while another has you steaming sushi. Just like in a real kitchen, none of the food makes itself, so you have to grab ingredients from crates, cut them on cutting boards, cook them, bake them, or whatever is needed, and maybe even wash dirty dishes, too. The orders never stop until the clock does, and if you don’t get an order out in a timely manner, it’s ‘failed’ and you lose some money on it, which can affect how many stars you’re granted at the end of a level. 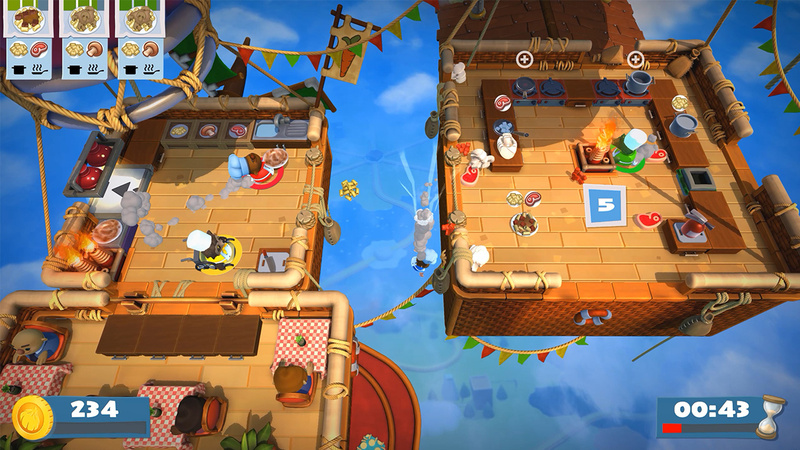 Wearing several hats and juggling several responsibilities at once is stressful enough in its own right, but Overcooked 2 takes things to another level with the kind of level design it employs. See, most kitchens are broken up or difficult to manoeuvre in some sinister way, which makes food prep hilariously more difficult than it needs to be. One level sees you running a kitchen on a hot air balloon, with powerful, random gusts of wind blowing your tables and ingredients around. Another has you running a kitchen that’s divided by a series of magic portals and disappearing stairs, orchestrated by a mischievous wizard. 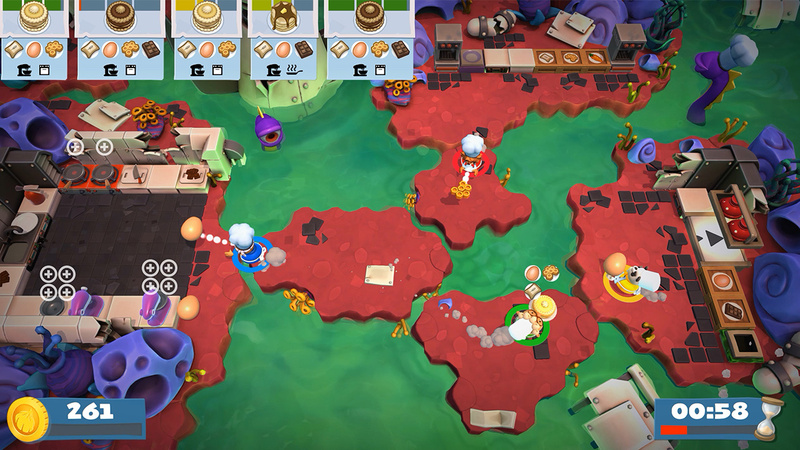 You’d be hard-pressed to find any kitchens past level 1-1 that don’t actively fight you in some manner, but that’s part of the ridiculous fun of Overcooked 2. It’s clear that Ghost Town Games has matured its understanding of the concept of this gameplay, too; Overcooked 2 feels like a tighter and better thought-out experience than its predecessor, offering up many more inventive and fun levels than before. Many levels are much more dynamic in nature, changing up objectives and obstacles as the timer runs down, which requires you to adapt on the fly. One memorable stage started in a hot air balloon making salad until the balloon flew into a storm, sending it careening through the roof of a sushi restaurant and giving your cooks the new objective of making sushi dishes, too. Stages overall feel livelier and more animated than before, and it’s a change for the better. New to this sequel is a game-changing feature: the ability to throw. Though it’s limited strictly to raw ingredients, so there’s no throwing plates or pans around, this simple addition has a surprisingly huge effect on the strategies that can be used to master a stage. You no longer have to be in ten places at once, as you can negate some of the running back and forth by simply tossing what you need to each other when it's required. Though it’s merely a helpful inclusion early on, later stages are often built around this concept and play with it in interesting ways, demanding a kind of dexterity that the original game didn’t require. The addition of throwing makes for an overall more action-packed experience while not losing any of the deliberate play of the original. Rather like the introduction of the spin dash in Sonic the Hedgehog 2, it’s an elegant way to expand and iterate on a good idea, and it’s something that feels sorely missed if you go back and play the original. 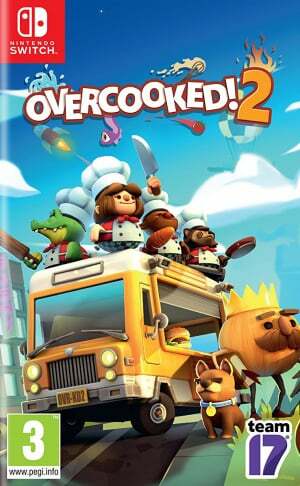 Overcooked 2 is completely playable in single player mode — with scaled back difficulty and hot-swapping between two cooks — but this is a game that was clearly designed with co-op multiplayer in mind, and what an experience it is. Up to four players can be in at once, and the weird and crazy designs of kitchens often make communication an absolute necessity if you want to get anything above a single star, but this is where the fun comes in. Unless you’re playing with a group of people that have previously worked well in a team-centric crisis situation, it’s only a matter of seconds before the kitchen devolves into utter chaos. Maybe someone forgot to take the noodles off the burner and set fire to half the kitchen, or someone tried running that completed dish across the river to the window and fell in, taking the dish with them. This constant, unpredictable madness is Overcooked 2’s strongest suit; the game is at its best when you have a couch of people shouting curses at each other about lettuce and dishes, while trying their best to salvage a quickly worsening situation. Factor in the game’s remarkable ability to introduce new ideas in every stage, and you’ve got a gameplay experience that’s different practically every time you play; just when you think you’ve got things down, the game tosses another curveball. One would think from the description thus far that Overcooked 2 is often frustrating or unfair, but that’s seldom the case. In fact, the opposite is usually true; it feels rewarding in the most cathartic of ways, particularly when you manage to find a flow that works for your group and you hammer out a perfect three-star performance after repeated attempts. New to Overcooked 2 is the inclusion of local and online wireless play, a highly requested feature that admittedly has some mixed results. Setting up a lobby and joining a game is straightforward and easy, but we ran into issues with the connectivity which bogged down the experience. Whether playing on two Switch consoles in the same room or with someone over the internet, there was noticeable lag encountered on both sides that hindered the ability to perform properly. It’s far easier to drop things or cause fires when the inputs don’t always respond as they should, and we even encountered a few times (even locally) where the connection dropped altogether. Thought voice chat isn't supported here — you'll need to use an external app like Discord if you want to talk to other players — players can utilize a series of in-game emotes and pre-set messages to communicate, which ensures that there’s plenty of ways to talk when playing with others. It feels a little counter to the idea of the game as a whole — part of the experience is hollering with someone next to you — but overall online play feels like a satisfying inclusion that will likely extend the game’s replayability dramatically for many players. If you’re ever looking for a more bite-sized way of playing, there’s also an arcade mode on offer, where you can select from a list of level themes and have the game pick a random stage. This mode is great for when you have a group of friends on hand and you just want to jump right in, or for if you just want a quick few rounds while waiting on a train. Versus mode sees a return here, too pitting two teams of two chefs against each other in one kitchen to see which team can get the most orders out. This changes the dynamics in interesting ways, as you can focus on getting as much food out as possible, or you can try to attack the other players, like throwing out one of their near-completed dishes. Versus mode is a fun reversal of the co-op gameplay concept, and of course, this is also playable online if you wish. On the presentation side of things, Overcooked 2 manages to supersede its predecessor in almost every way; this game looks way better in motion, and it all runs solidly, too. Though the art style is still kept to a chunky and relatively simple look, the stages feel much more detailed and colourful than before, in addition to all the extra visual fireworks that come with the dynamic stage changes. There are more cook avatars than before, too, and new inclusions like the unicorn and the platypus help to make it easier to pick out your character on the busy screen, while also making the game feel delightfully weirder. All of this is accompanied by a soundtrack that loves to go overboard with the guitars and the accordions, playing frantic and high energy tunes that perfectly gel with the goofy action and characters on the screen. The performance issues from the original are gone, as well, and while we did notice some occasional hiccups here or there in portable mode, this feels like a much better-optimized game. 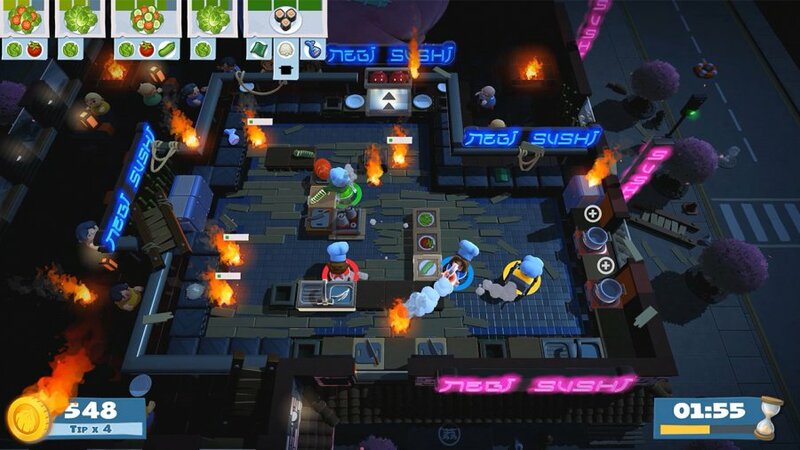 Overcooked 2 is a fantastic sequel to a co-op classic, building on the gameplay ideas from before in meaningful new ways while polishing up what was already there. There is a lingering sense that this is more of the same, but it’s such a blast to play that you’ll hardly be focused on the lack of any major innovations; overall, this feels like a stronger execution of the original vision. Overcooked 2 is a game that’s full of personality and heart, and we’d recommend this one to anyone looking for a fantastic party game. Played a couple of levels this morning, it looks like they made some solid improvements. What I didn't see right away but I was really hoping they'd add is an endless mode or something that lets you do a ton of different recipes (focusing on cooking and cooperation rather than level obstacles). Is the unlocking New Level easier than the prequel ? I can't wait to see this review when Filip Miucin uploads it on IGN! Oh no I forgot to preorder. Is there still any way to get the Platypus chef? @Anti-Matter Admittedly I couldn't really tell you, I usually three star levels before moving on unless I'm really stuck. I felt it was a little easier to get three stars on levels this time around, but that may be biased because I played through the first game already. As much as I liked the original, im struggling to find a reason for this sequel to exist except as a cash-grab. Should it have a genuinely good single player mode, yes, I'd accept that, but simply more of the same only more of it for me constitutes DLC as opposed to a new game. I'd be extremely happy to be proven wrong. Is it 60fps? This is such an important factor to the fluidity of a game like this, but I cannot find an answer anywhere. 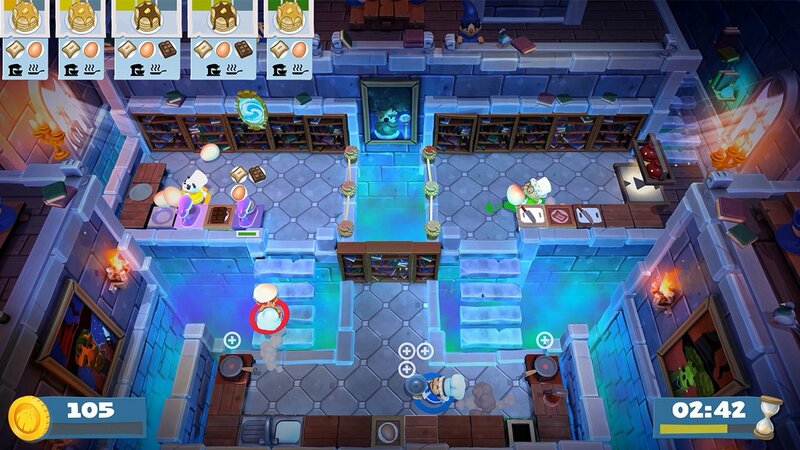 "You’d be hard-pressed to find any kitchens past level 1-1 that don’t actively fight you in some manner, but that’s part of the ridiculous fun of Overcooked 2." It´s real what I feared the most. Why not including a mode with less or non-transforming kitchens where just the recipes and meal requests put stress on you? 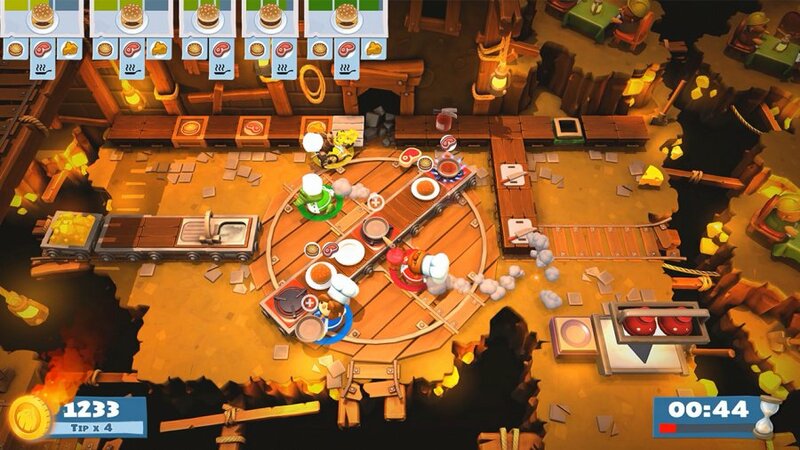 Overcooked 1 partly ruined our game experience with ridiculously transforming kitchens which took all the fun of playing. I still stucked on Level 5 World for Overcooked 1. The game asked me 51 stars to open Level 5-3 World, but i still have 49 Stars and I really struggled to get another 2 Stars accumulated from different Worlds. @Anti-Matter I know the pain, some levels definitely have some tight requirements. Practice makes perfect! Some of the moving kitchens in Overcooked 1 were a lot of fun, because you got to move them yourself for example (space levels). The ones that were worst were the ones that changed without giving any indication they were going to, and then completely ruin your chances to get a 3-star rating. I did beat the original game all the way but I felt like some poor levels, the harsh star requirements and the occasionally inaccurate controls (which thankfully has been fixed in 2) soured what would otherwise be a 10/10. You know, this pops into my head every once in a while when visiting your site and reading the reviews (And let me preface this by saying that at least the screenshots are nice and big and good quality here: Bad image quality was an issue I raised in a previous review): I really wish you'd put some videos directly into the actual reviews so we can easily click on the link and see these games in motion. It seems dumb that I either have to hunt the site to find some footage or head off to YouTube to do a search. And, in 2018, an online review of an interactive videogame with no actual moving gameplay footage is just under-cooked (see what I did there) and amateur as far as I'm concerned. For example in first Space lvl is not so hard to gain 3 stars when you play solo. @geox30 The first wasn't, so I'm going to guess this one isn't either. Like you, I've not yet seen confirmation. It's also the one reason I'm still considering picking this up on PC, rather than physical release on Switch. On the topic of score, when played correctly (Local co-op, 2-4 people) the first game is a 10/10 for me. Few games have been this much fun for me & my wife & friends, and I would highly recommend the games to anyone looking for a local co-op title. @Rika_Yoshitake joke? Copy and paste review like dead cells? Agreed,though the nature and visual style of this game is better suited to the Switch imo. I wish it could be played without compromises and I really think that with some effort put to it, there would be no reason for not being a flawless 60. Another game with built-in voice chat. Take note, Nintendo. Take note. @geox30 I won't disagree. There's enough games that run better and look better, that it should certainly be possible. As I mentioned previously, Overcooked is a 10/10 game for me when played with others locally, and I purchased it on PC and Switch both - extremely rare for me unless I am double dipping for a physical release. For the most part, I wish I would have not double dipped in this case. The performance issues meant I always wanted to play it on PC instead. @NintendoFan4Lyf This is a goof on Nintendo Life's part. Overcooked 2 does not have Fortnite-style native voice chat on Switch. 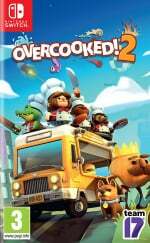 I've tested it myself and even the official Overcooked 2 F.A.Q page states that Switch owners will have to use a third-party chat service such as Skype or Discord. So, is there Voice Chat or not? @Folkloner Bummer. Thanks for the info! Glad to hear the performance is better now, it was really an amateurish mess in the first one. Is the difficulty better set-up this time? Given that this is a casual game to be played with other halfs and kids, the original ramped up to a very high difficulty too quickly. @NintendoFan4Lyf Yeah. After i read that above i was overjoyed. That said, i am glad to see that you can play Story Mode online with friends. You just have to press 'X' on the main menu and host / join a friend and 'then' enter Story Mode. Friend[s] can join 1-3 players on a single Switch and play Story, Arcade, Versus together if the 1-3 players on that single Switch are the host - which is nice, but it doesn't work the other way around at launch. Should I play the first before this one? And is it any fun to play solo? I love, love, love the first game and believe it or not, I had a really hard time tracking down an physical copy of this one. But I finally found one and I can't wait to play it, even if it's more of the same (sort of). I just love the wacky scenarios they place you in. This is great...as long as we don't see a sequel for at least a year. I know the first one was out for a while before we got it on the switch. Thing is, I could see them releasing fairly simple sequels quickly, but hopefully not. Please slow down on eshop releases. I don't have the time to play all these games, even on the toilet. Thank you. Are you guys going to be reviewing Sleep Tight? @krvstkvlt First Overcooked doesn't have online, I wouldn't get it for single player personally. This one does have online, but there's no voicechat on Switch. Did anyone preorder this on Amazon? If so, did the one code that they gave you include all of the bonus chefs? I already have a copy of the game and a preorder code from Amazon that I haven't redeemed yet. I was really disappointed in this. The first game felt really rewarding when we were able to move on and eventually complete the game (and bear in mind, I was playing with my girlfriend who doesn't normally commit to finishing games). Whilst I appreciated a lot of the new additions, it felt far too easy and I could probably count the levels on one hand that we had to try a second time to even get one star and we never struggled to gain enough to unlock the next. The ending felt very anticlimactic as well. Also, a slight annoyance, but I hated that the character select screen was on the main menu, backing out just to change became frustrating. But I did like the new characters. We loved the first and would give it a 9/10. @SwitchVogel Surprised to see people saying it's too easy, I'm loving the challenge! @mid_55 You might want to try recalibrating your sticks, it's not a known issue as far as I know. It's been awhile since I've played OC2, but I do recall there being a certain imprecision to the controls; you might just need to spend a little more time with it to get the feel down. @SwitchVogel thanks for the reply! Tried recalibrating motion and sticks, no luck... they're way off before calibration, then fixed, then other games are fine once again, and OC2 whacks them out of sync again... console is super close when we're playing as well, so I'm sure it's not distance related. For example 4 players on Mario Party or 1,2, Switch, I've had no issues like this at all... weird! Makes it a nightmare at best, so hard to get past some of the levels like this. On Reddit it looked like a few people were reporting similar but I've not heard much. Might write to Team17.